These big scoops of deliciousness are great to have around for your guests. Why I make so much? I love to freeze these scoops of cookie dough for later when I have a sweet tooth. I'm selfish that way. This recipe can easily be halved, or try my HUGE batch to help make your life easier, and a little more sweeter! Cook Butter in a medium sauce pan on medium low heat, until it slightly browns. About 5-7 minutes. Do not let it burn. Pour in a ceramic or glass bowl to keep the butter from cooking further, set to the side, and let cool slightly. Whisk together flour, baking soda, & kosher salt in a medium bowl while your butter cools. Mix brown sugar & granulated sugar in a mixing bowl, and add the browned butter. With the beater attachment, beat until incorporated, about 1 minute. Add eggs & vanilla, and beat on medium speed until light in color, another minute. The mixture should thicken a little bit. Reduce speed to low, and mix in the dry ingredients (flour mixture). Make sure to stop the mixer, and scrape the sides down with a rubber spatula at least once. Add chocolate morsels, caramel bites, and pecans. Fold in with a spatula, or you can use your mixer but do not over mix. Try to only let your mixer roll around once or twice. Set your batter to rest about 30 minutes, room temperature. This helps your flour to hydrate. Using a large cookie or ice cream scoop, portion out large balls, about 2 inches in diameter. The bigger the better when it comes to cookies right? You can also use your hands to roll out in a perfect ball, but the cookies will flatten while baking. Sprinkle tops with flaky sea salt. This batch will make about 20 HUGE cookies. You can always split the recipe in half, but I love freezing some for later, or having a big batch for guests. These make great ice cream cookie sandwiches! To Bake: Preheat oven to 375. Place cookie scoops on sheet pan prepared with parchment paper. Keep about 2 inches of space between each cookie, they will expand while baking. Bake for 9-11 minutes. Let cool a little, then move to a cooling rack. Let them cool completely or enjoy warm (that's how I like them)! 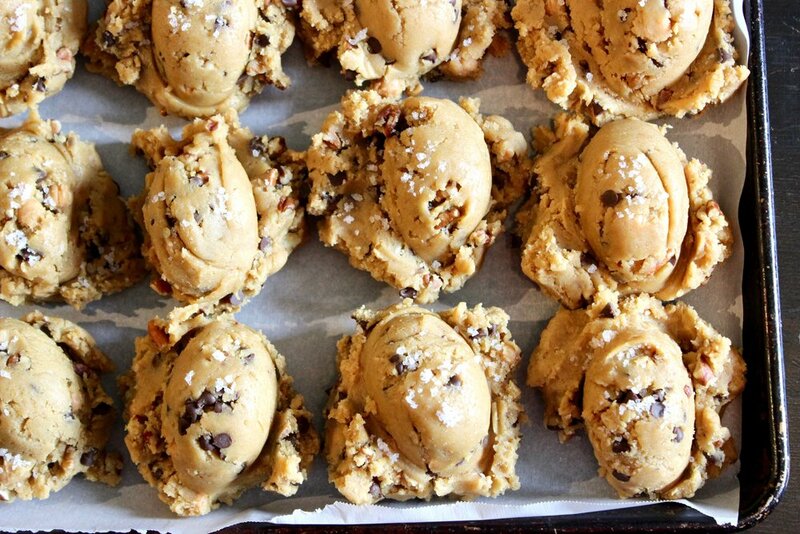 To Freeze: I like to freeze cookie dough scoops for later. you never know when you may have a sweet tooth! Vacuum sealing is definitely my favorite way to do it, but if you do not have a machine ziplock bags work great. Just try to push out as much air as possible. Place your cookies scoops in a single layer in your fridge, or freezer covered with wax or parchment paper for 4 hours, to overnight. Place in ziplock bag, or vacuum seal. I like to freeze mine in packages of one, or two cookies, just for those simple nights. If you are freezing for future group gatherings, you can keep tons of cookies in one package! When baking the frozen cookies, preheat oven to 350. Place cookie scoops on sheet pan prepared with parchment paper. Keep about 2 inches of space between each cookie, they will expand while baking. Bake for 12-15 minutes. Let cool a little, then move to a cooling rack. Let them cool completely or enjoy warm (that's how I like them)! These bad boys will keep in the freezer for 6 months to a year!